A list of celebrities who passed away in 2017. Rest in Peace. Whether it has been a musical influence, a beloved character or just the very fact that they have put a smile on your face…There's something surreal, yet a little "too real" about a celebrity death. Here are some of the legends we have said Good bye to in 2017. If you feel I am missing someone, or would like to see someone added to the list – Please let me know. Cause of Death: Various illnesses, passed away in her sleep. Cause of Death: Not yet released. Cause of Death: Not released. Cause of Death: Coma but cause of death has not been released. Autopsy declined. Cause of Death: "Medical Condition"
Cause of Death: Speculated accidental overdose from pain medication. Coroner report not yet released. Please let me know if you feel I am missing someone, this list should be updated or if you spot a mistake. Don't forget to come on over and join the Wifetime of Happiness family on Facebook – We'd love to see you! 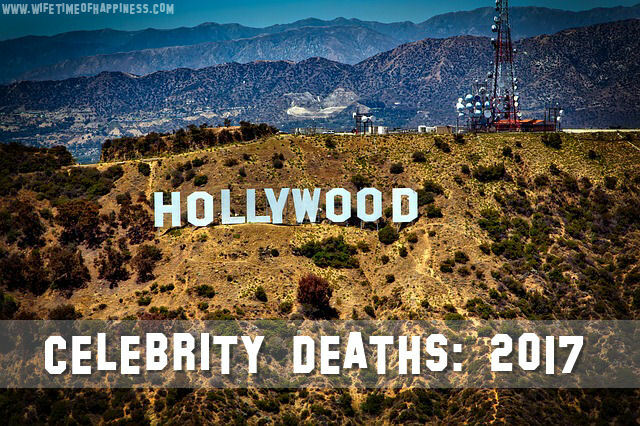 This entry was posted in Celebrities, Lifestyle, TV Shows and tagged 2017 celebrity deaths, Aaron Hernandez death, adam west death, Al Jarreau death, Alan Colmes death, Ashley McNeely death, Auntie Fee death, Barbara Hale death, Bill Paxton death, Bob Carter death, Brad Grey death, Bruce Hampton death, celebrities who died in 2017, celebrity deaths 2017, Charlie Murphy death, Chavo Guerrero death, Chris Boykin death, Chris Cornell death, Christian Evans death, Chuck Berry death, Clay Adler death, Colo death, Don Rickles death, Dorothy Mengering death, Dr. Brandon Rogers death, Erin Moran death, George the Animal Steele death, Glenne Headly death, Gregg Allman death, Harambes Grandma, james hardy III death, Jimmy Snuka death, John Hunt death, Judge Wapner death, Katherine Berman death, Lee O'Denat death, Leonard Myers death, Lisa Spoonhauer death, list of celebrities who died in 2017, list of celebrities who have died in 2017, Mary Lee South death, Mary Tsoni death, Mary Tyler Moore death, Matt Anoa'i death, Michael Mantenuto death, Michael Nance Death, Miguel Ferrer death, Mike Ilitch death, Neil Fingleton death, Nicky Hayden death, Norma McCorvey death, Paul O'Neill death, Paulie Giganti death, Powers Booth death, Roger Moore death, Steve Holcomb death, toby smith death, Tommy Page death, Vince Jones death, what actors died in 2017, who died in 2017, Yordano Ventura death.